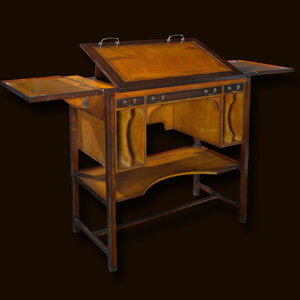 Ref: MF118 Rare and remarkable, this whimsical desk. 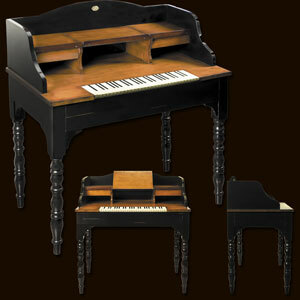 A make believe set of clavichord keys includes one that magically releases an unobtrusively placed drawer. 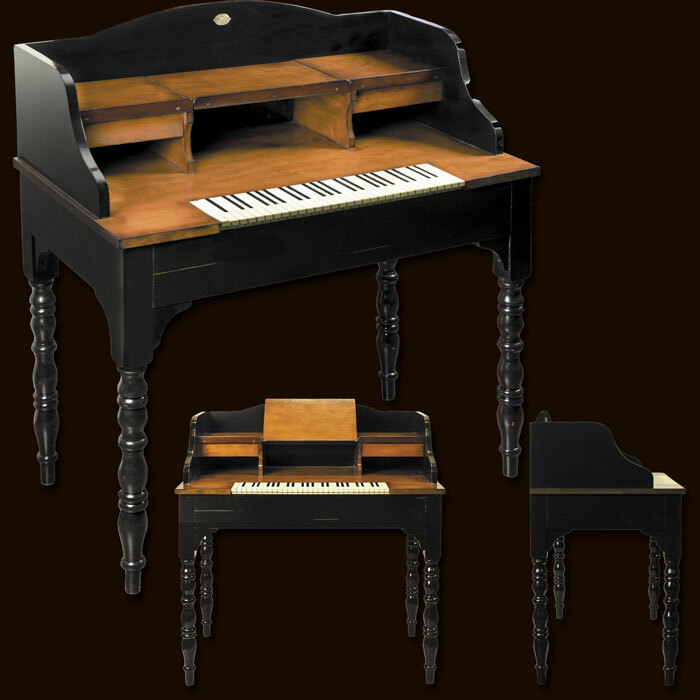 The story goes that Chopin, the famous 19th C. composer, was fond of whimsies and had a design for a similar desk drawn up. Since the story is apocryphal it may or may not ever have been made. 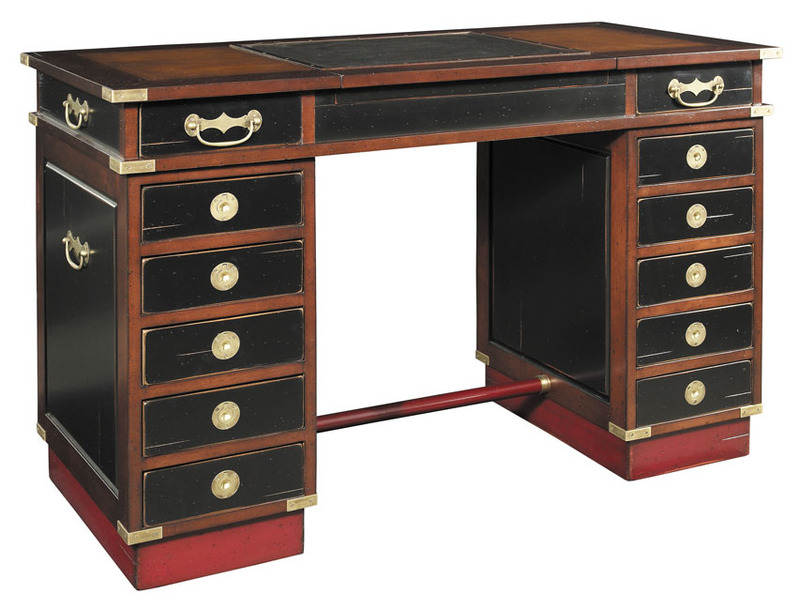 At any rate, it was a lot of fun developing this unique desk, and we feel the secret drawer adds another dimension. The unexpected and hard to notice visual aspect results in a secret space, with lots of space! 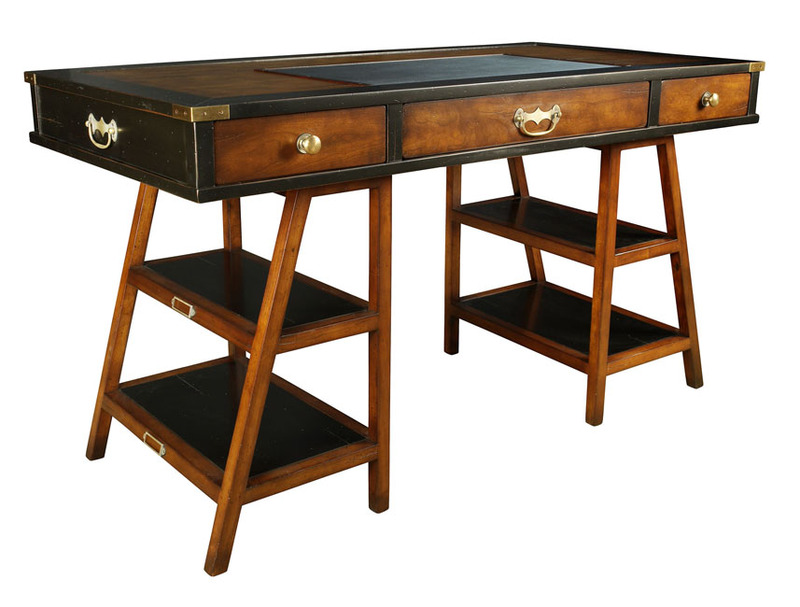 The desk ships with legs disassembled, sets up easily, and is a great conversation piece! or a living room live-in support unit holding essentials! Ref: MF011 Travelers and seafarers of yore had to be resourceful in order to survive. Desks on board ships had to be cleared and stowed at a moments notice. Things had to be multi-functional. In the case of our desk, the two supports could act as steps into the navigators bunk, or to mount a camel, whichever came first. 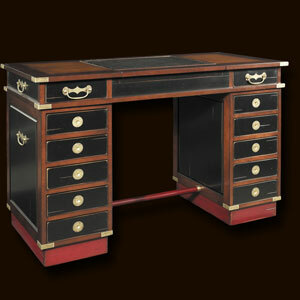 The desktop, complete with drawers and brass bound, could act to stop musket bullets when under fire. Leather top, hand rubbed French finish, somewhat beat-up; proof of its many voyages and colorful history. M. 55 x 27.5 x 30.75"
Ref: MF022 Anyone who considered himself an officer and a gentleman expected total comfort under canvas. How could a chap hope to compose letters without a desk, play chess without a game table or store his clothes without a chest of drawers? The solution was to equip himself with a decent suite of campaign furniture. Often decorative enough to grace the finest drawing room, campaign furnishings were designed to be easy to transport and assemble. Ideal for the military officer on the move. Ref: MF013 Captains made good use of notoriously cramped quarters in the ships stern section (deckhands were housed before the mast). 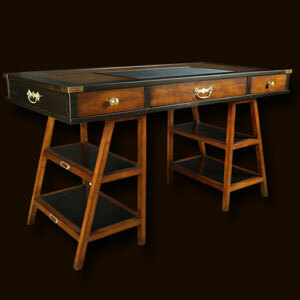 The captains desk was tailor made to offer maximum comfort and space in a minimal floor area. Drawers to house the crews papers, sealed sailing instructions, logbooks, charts, instruments and a pair of flintlock pistols. Brass corners to protect from damage when being moved around. Sturdy construction to withstand often violent ships movements. Well-traveled. Sturdily made of cherry and maple. Leather inset top. Ref: MF014 Captains made good use of notoriously cramped quarters in the ships stern section (deckhands were housed before the mast). 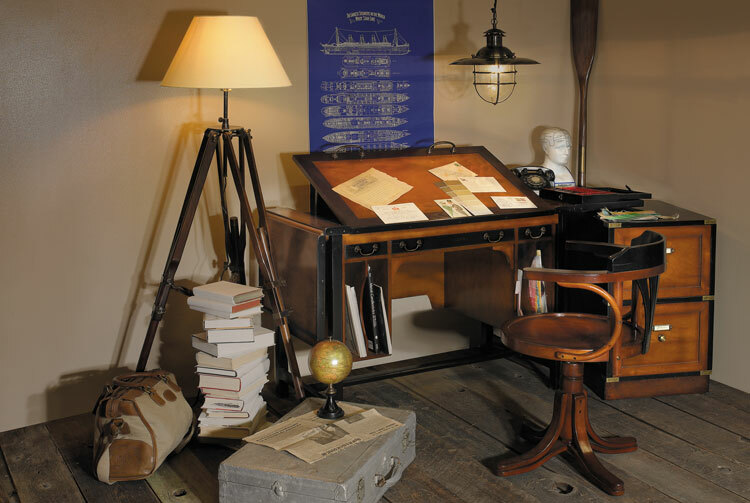 The captains desk was tailor made to offer maximum comfort and space in a minimal floor area. Drawers to house the crews papers, sealed sailing instructions, logbooks, charts, instruments and a pair of flintlock pistols. Brass corners to protect from damage when being moved around. Sturdy construction to withstand often violent ships movements. Well-traveled. Sturdily made of cherry and maple. Leather inset top. Ref: MF056 You want something solid. Lived in and comfortable. Warm and rich looking. Soft and easy to the touch as if waxed and polished by generations of housemaids. 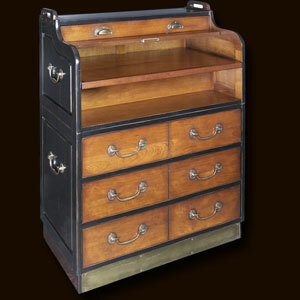 Drawers to hold documents and treasures. Brass campaign corners to survive damage during challenging moves across the country or even oceans. After all, our furniture is made to travel well. Ref: MF086 Architects were once skilled draftsmen and graceful calligraphers, able to draw a crisp and perfect line on virgin drafting stock. 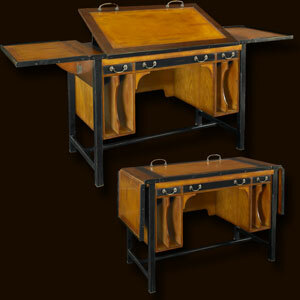 They worked at a classic architects desk crafted of precious woods, with an adjustable work surface tilted to an individualized angle. Usually they would stand, lounge, and lean on the tall desk, discarding the chair or replacing it with a tall, narrow stool. In our day and age, we have done away with the standing desk. We hammer away at keyboards for days on end, slumped in a desk chair. Actually, a recent scientific study showed that working at a standing desk all day equals the exercise provided by a robust morning workout. 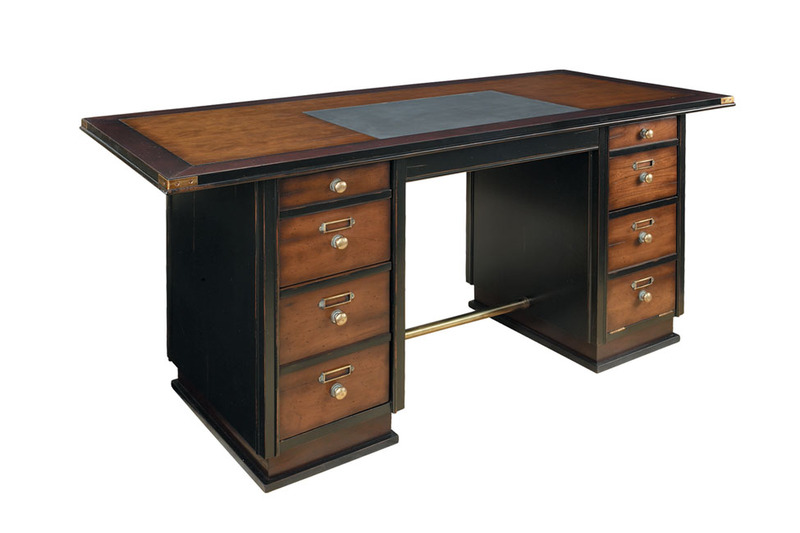 Coming in two heights, our unusual and attractive architect desk is designed with many practical features, including extended side flaps, vertical folder slots, and subtle, yet highly functional drawers. 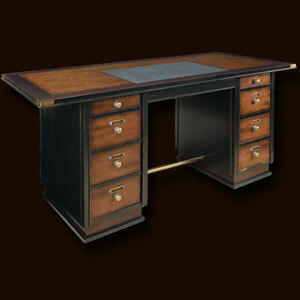 Most exciting, its adjustable work surface contributes to a completely new work experience. 21.75 x 43.25 x 30.25"
Ref: MF087 Architects were once skilled draftsmen and graceful calligraphers, able to draw a crisp and perfect line on virgin drafting stock. 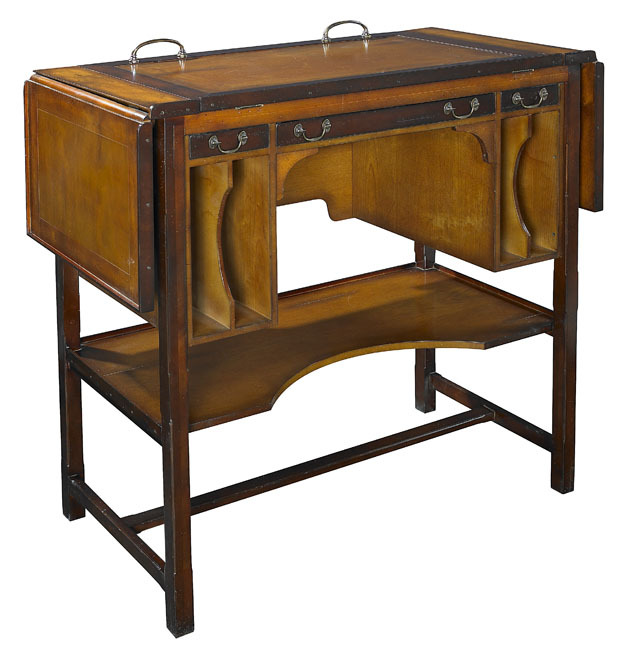 They worked at a classic architects desk crafted of precious woods, with an adjustable work surface tilted to an individualized angle. Usually they would stand, lounge, and lean on the tall desk, discarding the chair or replacing it with a tall, narrow stool. 21.75 x 43.25 x 39.5"
Ref: MF039 Filing cabinets are essentially boring entities. Choice-wise theres not much out there. Grandeur and elegance is not associated with the domain of organization. Stashing your files in a Hermès backpack or a vintage Louis Vuitton trunk, while certainly fancy, is not overly accessible. Compare these with our two-drawer Campaign Files. Ready to travel. Rolls where needed at the push of a finger. 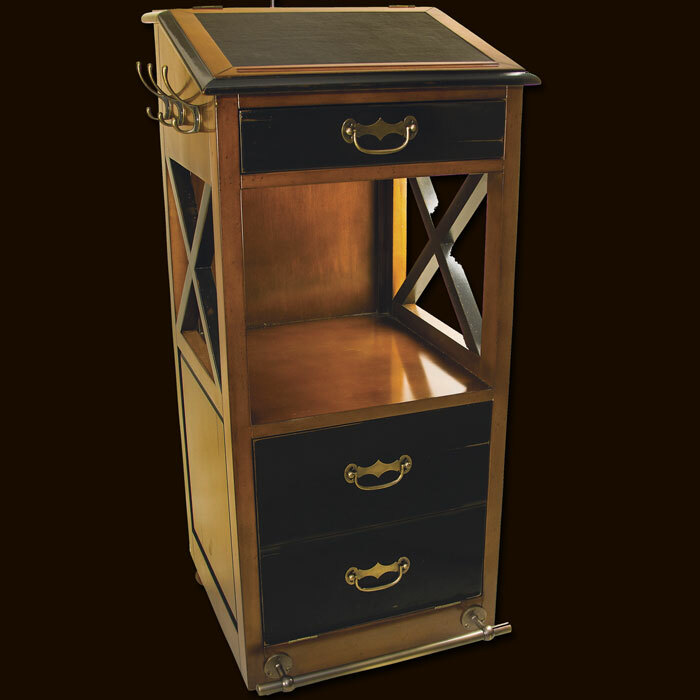 Laden with written treasures, documents, papers of content Brass bound, wood, this cabinet is made to be handed down through generations. 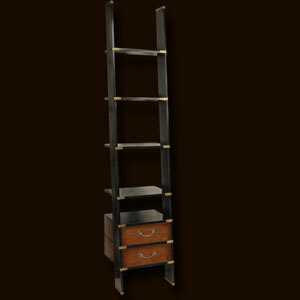 It features a striking library ladder, offers a multitude of large and small drawers, and is designed to fit in rooms large and small. 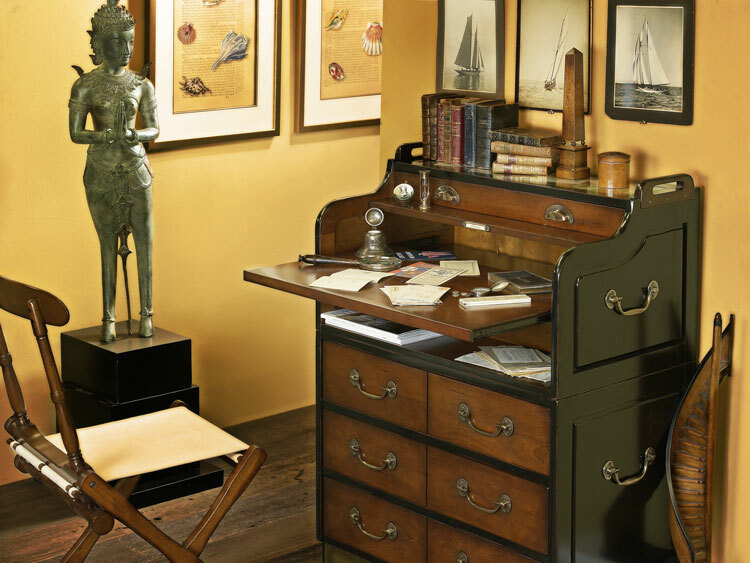 It carries solid bronze, hand rubbed and polished hardware. Hard to find this detail and finish even in antique ones. Pull out the shelves to showcase the latest addition to your collection or just the book you want to read next. Ref: MF088 Kunstkammers are on display at the Nazional Museum in Munich and several other major European museums in the region. 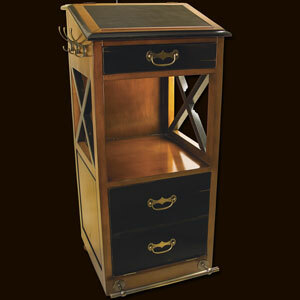 Measuring in size from diminutive cabinets with just a few drawers to cabinets that fill entire rooms, they date from the Renaissance to the Age of Enlightenment. Every noble, titled, moneyed or learned gentleman of the day was an assumed collector of unique and unusual objects. This culturally collective behavior was a favored topic of conversation. Individuals, as well as complete expeditions, were fitted out and sent to remote corners of the globe to collect. Old books were hoarded as well as shells, skulls, ivories, minerals, classical art creations and historical artifacts. A prepared crocodile was a highly desired specimen that might hang from the library ceiling. Ref: MF036 Dispatched for victuals for the captains table or canvas for a sail blown away in a storm, gigs were invaluable when in port or moored outside. Referred to as rowboats by land-bound folk, a gig was easy to lower overboard, needed minimum crew, and was quick to dispatch. When stowed, it nested in the long boat or pilot boat secured in the center of the main deck. 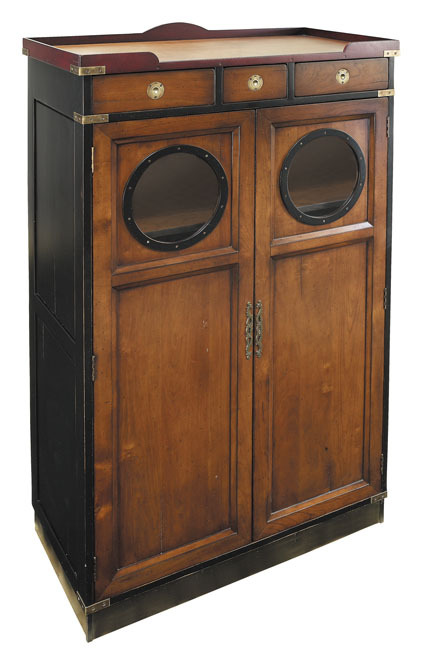 Our lapstrake (overlapping strips of wood) gigs are not seaworthy, but they most certainly look like it! 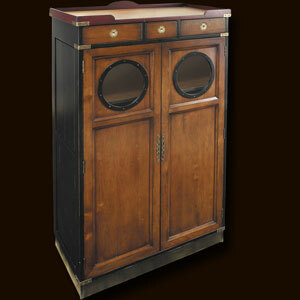 Clinker build, they add flair and atmosphere to any room, and display shelves turn them into fun cabinets and bookcases. as well as armchair sailors. M. 18.25 x 36.5 x 60.5"
M. 17.75 x 19.75 x 96.50"